People who know Claressa Shields have said her difficult childhood drove her to be the successful athlete she is today. Shieldsgrew up on Flint’s north side. Her dad was in prison until she was nine for a breaking-and-entering charge. 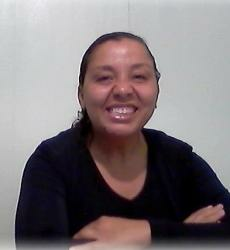 Her mother was an alcoholic, who also struggled with drug addiction. When she was drunk, Shields said sometimes she hit her. Shields never hit back. Shields said that although her mother received food stamps to buy Shields and her siblings food, Shields believed she sold the food stamps for drug money. So, Shields was often hungry as a child. She slept on the floor because she did not have a bed. In addition, Shields said she was sexually molested by several males who came to visit her mom, as well as by her youngest brother’s father. Other children teased Shields because she wore a frizzy afro and had a small frame. Shields said at that time in her life, she did not think things would ever get better. “I had a lot of anger as a child,” she said. However, when she was 11 something happened that turned Shield’s life around. Her dad, who made money as a street fighter, told Shields a story. He told her about how Muhammad Ali had several children, but his daughter followed in his footsteps as a boxer. At first, Shields thought he told her the story because he wanted her to box. Yet when Shields told him she wanted to take boxing lessons, he said females should not box. Eventually, however, he took his daughter to Berston Field House where she began to train as a boxer. She was the only female boxer at the gym at that time. “I didn’t have an impression of her at first. I didn’t really pay her no mind because she was a female boxer,” said Jason Clutchfield, who later became her coach. Clutchfield said he gave her to another man to train initially. The other coach trained her for about two weeks, then did not show up to the gym one day. When Clutchfield asked Shields to show him what she had been learning, he was surprised to see she was doing things better than the boys. “That’s when I said you gotta come with me,” he said. Clutchfield said Shields was easy to train because she listened to everything he taught her and trusted him. The duo traveled to Columbus, Ohio for Shields’ first fight. Clutchfield said she did very well on the fight. “She smashed the girl. She done real well and acted like she liked it,” Clutchfield said. Shields continued to win fight after fight after that. She said the gym was the first place she felt accepted. Shields eventually asked if she could live with Clutchfield. At first Clutchfield said “no,” but when Shields made it to the Olympic trials at age 16, he agreed. He said he knew Shields could get a gold medal, but she needed to be focused. “She wanted to live boxing,” he said. Clutchfield said he always told Shields to respect her parents. Shields said she viewed Clutchfield as family. “Whatever they didn’t do, I did. Whatever they didn’t have, I made sure I had it,” Clutchfield said. Due to lack of funding, Clutchfield was unable to accompany Shields to Qinhuangdao, China for the 2012 AIBA Women’s World Boxing Championships. It was the first time she fought without him. Although Shields won the first round of the fight, she suffered her first loss there to Britain’s Savannah Marshal. Clutchfield said he thought it was his fault for not being there. Despite the loss, Shields advanced to the 2012 Olympics, held in London, England. She said she had to adjust to new coaches, but beat Russian boxer Nadezda Torlopova. The victory earned Shields the gold medal and $25,000. Most of the money Olympic athletes typically makes comes from sponsorships and endorsement, however. Unfortunately, Shields did not get the national sponsorships or endorsements she expected to get. “Things did not change as much as I expected them to,” she said. Shields continued to win every fight she fought for four years. Meanwhile, a documentary about Shields, called T-Rex, was released on PBS. Shields qualified to represent the United States in the Olympics again in 2016, this time held in Rio de Janeiro, Brazil. She fought against Nouchka Fontijn of the Netherlands. Round after round, Shields delivered uppercut after uppercut. She continued to pound her opponent, who was six inches taller than her, on the chin. At the end of the fight, Shields bounced up and down with excitement before the judges’ decision was announced. She knew she had won, and her hard work had paid off. She won by unanimous decision. 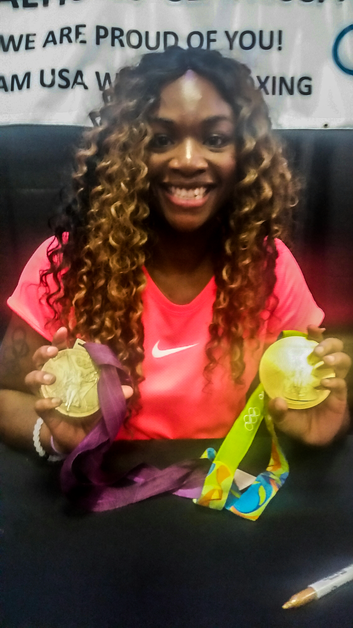 Shields became the first U.S. boxer to win back-to-back Olympic gold medals. After the medal was put around her neck, Shields pulled the first gold medal she earned out of her pocket. She also placed it around her neck. “People didn’t give me the recognition for doing it one time. So, I was like, you know what? I’m gonna put on both, so people will always remember and never forget that I’m the first American boxer to win two Olympic gold medals in consecutive games,” she said. Shields said she took the spirit of Flint with her into the ring. She said she tried to get a knock out for Flint. During the fight, she said she was mentally telling her opponent: “I’m not gonna let you hit me in front of my people. We’ve been hit enough.” Shields is currently living where the national office of USA Boxing is located, Colorado Springs, Colorado. She has been there for the past year, yet she visits Flint often. Her mother and sister still live in Flint. Her dad no longer believes females should not box, and Shields has helped change many other people’s view on female boxing. Clutchfield is no longer her coach, but Shields visits him at Berston Fieldhouse and at his house when she is in town. Berston Fieldhouse staff distributes bottled water to the Flint community when supplies are available, and Clutchfield and the other coaches there continue to provide their services free of charge. Clutchfield coaches a few boxers who are 13-15 years old, and who have won national titles. He uses Shields’ story to inspire his current fighters. Clutchfield also continues to work as a cable TV contractor. Shields texts Clutchfield regularly. They talk about boxing technique and the technical aspect of the game. When she is training, she tells Clutchfield she still does the same routines she learned at Berston. However, Shields is taking about a month and a half away from the gym. She is busy with an endorsement with Powerade and a 22 second commercial. She also has a sponsorship with the Universal Kidney Foundation. Her record is 77-1. “Claressa Shields is a role model for the young, for the old and for everyone in Flint,” said Mayor Karen Weaver at a recent celebration held at the Dort Federal Event Center for Shields. In the future, Shields said she will do anything she can to help Flint. She said people should help their neighbors. “Money is not gonna fix Flint. We can fix Flint,” she said. Universal Pictures has teamed with Michael De Luca Productions to acquire the rights to produce a feature film on Shields’ story. “I think Ice Cube should play (my ex-trainer) Jason (Clutchfield), and Keke Palmer should play me,” Shields said. She also said on Twitter she likes Angela Bassett. Shields said she will consider becoming a professional boxer. She would also like to win a third Olympic gold medal. Ideally, she said she would like to do both if the Olympics will allow professional boxers to compete in 2020. “Professional women’s boxing is not nowhere near on the same attention level the Olympics are. I get more attention than any female boxer right now with me being an amateur. The goal is to go professional, but get the same attention as the Olympics,” she said. Clutchfield said his goal for Shields’ future is that she be a model citizen, and get a family of her own. He hopes Berston Fieldhouse never closes down, and remains open to the community. His vision for Flint is that jobs come back to the city. He said Shields represents Flint well. “Flint is really a no back down town and Claressa is a no back down girl…Flint’s still going despite the economic problems, the crime and the water problem. Flint’s got Back to the Bricks, The Crim and now the first, U.S. boxer to win two consecutive gold medals,” he said. Previous articleWhat Makes Michigan International Speedway a Favorite Track for NASCAR Fans? We Found Out!